Stoll is delighted to have received a grant of £15k from the Morrisons Foundation to help create a Veterans’ gardening space at Centenary Lodge. 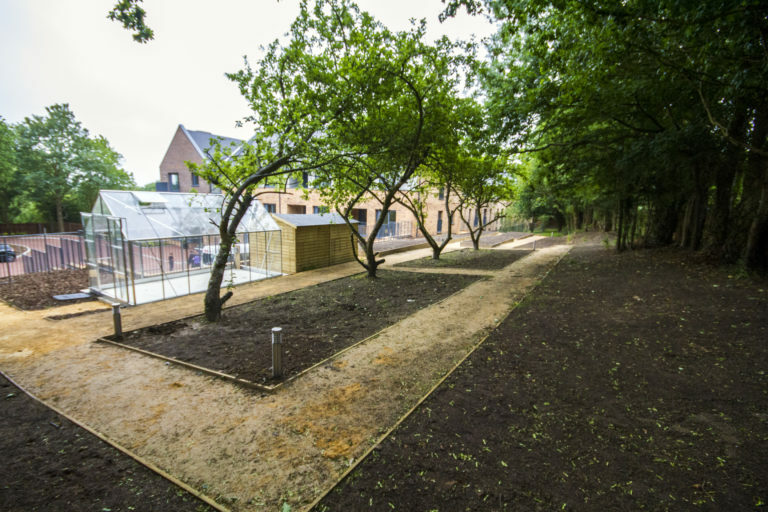 The wheelchair accessible allotment space consisting of raised beds, potting shed and greenhouse will allow year-round gardening for residents of this new housing development opened in June by Stoll’s patron, HRH The Countess of Wessex. The donation from the charitable entity of the major supermarket chain, represents half of the cost of landscaping and constructing the allotment space and equipping it with gardening tools and equipment. The project will encourage the residents of the 34 purpose-built homes near Aldershot to garden – promoting physical exercise, social interaction and independence. The garden project will empower Veterans to grow their own food and give them a sense of pride, achievement and community spirit. The allotment space is one of a number of therapeutic elements of the Cohen Memorial Gardens that surround Centenary Lodge. The gardens were dedicated in memory of Stanley Cohen OBE and wife Joy who were supporters of Stoll and contributed to the construction. The development has been shortlisted in the Best Affordable Housing Development category at the prestigious Inside Housing Development Awards. The Morrisons Foundation supports charities making a positive difference in local communities. Since launching in 2015 the foundation has donated over £18m to help good causes across England, Scotland and Wales.